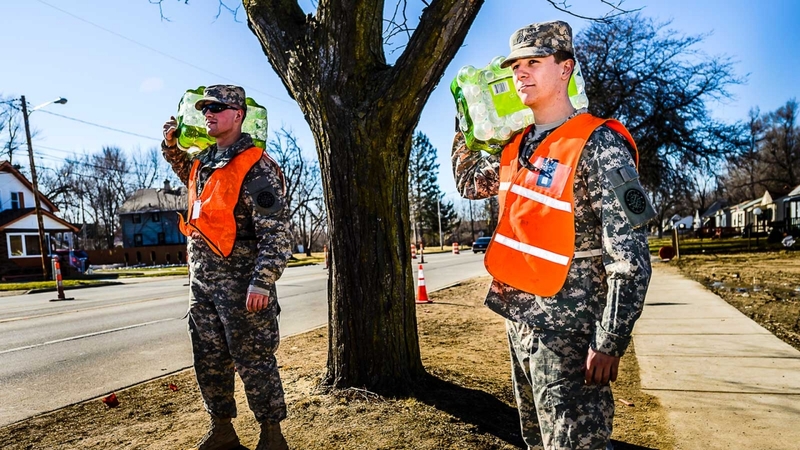 Comcast employee and reservist Kyle Woodard (right) responds to the water crisis in Flint, Michigan. Our military ties go back to our roots. World War II and U.S. Navy veteran Ralph J. Roberts founded Comcast, and since then, we’ve become a leader among veteran and military community employers. But a lot has changed for veterans over the years — and we’re dedicated to addressing these new challenges head-on. When members of the National Guard and Reserve return to civilian life after extended military service, their employers can make things easier by building a supportive culture with like-minded teammates. Military spouses also face employment challenges, since the potential for relocation often limits their job opportunities, regardless of their qualifications. In 2012, we pledged to hire 2,000 veterans by 2015, and in 2015, we pledged to hire 10,000 members of the military community by the end of 2017. We surpassed both goals, and since 2010 we’ve added more than 15,000 veterans, National Guard and Reserve members, and military spouses to the Comcast NBCUniversal family. Our success has led us to expand our hiring and outreach efforts. “This isn’t just lip service. These aren’t just things that we’re doing to meet a number. We’re actually building out an infrastructure to hire, develop, and retain our military community employees,” explains Carol Eggert, retired U.S. Army Brigadier General and Senior Vice President of Military and Veteran Affairs at Comcast NBCUniversal. We know that supporting our military community takes more than employment alone. We’re using our resources and reach to foster nationwide partnerships that empower the military community, and embracing volunteer service opportunities to support the efforts of many veterans and military-related nonprofit organizations. Our mission? Following through on our commitment to serve customers, communities, and country.